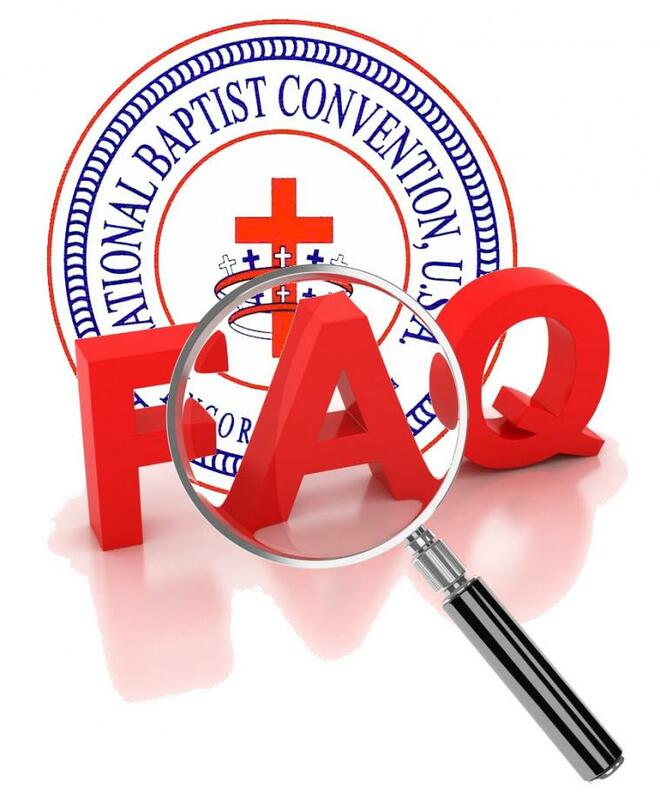 These FAQs are related to The National Baptist Convention, USA, Inc. You can scroll through the FAQs or use a key word search. To access the search feature in your browser, press the "CTRL" and "F" keys at the same time OR click the "F3" key. Type your word(s) in the search box and click the up or down arrow. Your results will be displayed. To see more results, use fewer key words. To see fewer results, use more key words. Convention Membership: How do you join the Convention? Registering for the “Annual Session” results in the initiation or continuation of your membership with the National Baptist Convention, USA, Inc. Although attendance at the Annual Session meeting is not mandatory, your annual registration is required to continue your membership with the NBC, USA, Inc. Registration is offered year-round, however, you must be registered by December 31 of each year to maintain your membership status. For more information about registering, visit: http://www.nationalbaptist.com/meetings--events/annual-session/registration-information.html. Convention Membership: What are the benefits of membership? Convention Membership: What are the rules members are required to follow? Convention Membership: If our church joins the local district association does that makes us a member of the NBCUSA? The answer is yes and no. If your church does not join the Convention, then technically it is not a member of the National Baptist Convention, USA, Inc. However, your church would be considered as being affiliated with the National Baptist Convention, USA, Inc. through your District Association only if the District Association holds an active membership with the National Convention. The same would hold true if you substituted “State Convention” for District Association. The National Baptist Convention encourages churches to hold membership at the District, State and National levels. Convention Membership: Can individuals join the Convention? Yes! “Memberships” are generally taken up during the Annual Session, every September. The Mid-Winter Board Session, provides an opportunity to support the Convention financially and to stand up and be counted through a process the Convention calls, “representation.” To register as an individual, you should download and print the "Parent Body" registration form found in the Annual Session link under the "Meetings" tab located on the home page. You may register at any time. Convention Structure, Policies & Procedures: Can you explain how the Convention works? Moderators/Districts: Can a woman be a Moderator? Convention Intervention in Local Church Affairs: Can the Convention help our church settle a problem we are having with our Pastor? Does the Convention offer assistance in resolving disputes? Clergy Support Services: What support does the Convention offer for novice female ministers?